Public attention has been drawn to the recent successes of the far right. This article claims that a new wave of anti-establishment parties has shaken European politics. A diverse array of outsiders from the left, right and no fixed ideological abode are attacking the mainstream centre–left and centre–right. Their anti-elitist approaches to politics have strategy, topics and style in common. Examples such as Syriza (The Coalition of the Radical Left), Podemos (We can!) and the Five Star Movement (MoVimento Cinque Stelle) show that this provocative new spectre of the twenty-first century is not just right wing. Political observers have given much attention to the far right and to right-wing populist challengers. Since the 1990s, in particular, these parties have either entered national parliaments for the first time or increased the number of seats they hold. In most European countries they are relevant political players. It is true that, at the moment, right-wing populist parties are part of the government in only four countries: in the non-EU countries Norway (the Progress Party, Fremskrittpartiet) and Switzerland (the Swiss People’s Party, Schweizerische Volkspartei); and since the most recent elections in 2015, in the EU countries Greece (Anexartiti Ellines, Independent Greeks) and Finland (Perussuomalaiset, The Finns Party). However, that these parties are generally found in the opposition should not lead one to underestimate the phenomenon. The recent European elections in 2014 have once again shown that such parties can attract a critical mass of disillusioned floating voters, particularly with their clear anti-immigration stance, but also with the message ‘Europe – no thanks!’ (Grabow and Hartleb 2014). The politics of exclusion, intolerance and xenophobia on the right-wing end of the political spectrum certainly deserves attention. Distrust in conventional parties seems to consistently correlate with far-right outsider party support and has become a permanent factor in European party politics. However, the sole focus on the ‘radical right-wing party family’ is, in some respects, misleading. This can be seen from the following four points. First, the right-wing parties differ considerably, ranging in nature from democratic to clearly extremist. Moreover, they come from member states from Western to Central Eastern Europe. Consequently, after the European Parliament elections in 2014, they did not form a European group, but split up into different factions or decided to stand alone. The ‘merger’ of Marine Le Pen, leader of the French National Front (Front National, FN); Geert Wilders, leader of the Dutch Party for Freedom (Partij voor de Vrijheid, PVV); and Heinz-Christian Strache, leader of the Freedom Party of Austria (Freiheitliche Partei Österreichs, FPÖ), was more a successful public relations stunt than a real sign that they intended to join forces. These parties operate more on the idea of a common enemy (e.g. the West, the EU, Islam, globalisation, elites and the media) than on a shared ideology or coherent programme. Second, this focus neglects the fact that the classical left–right dichotomy in politics loses much of its relevance in the framework of anti-establishment protest politics. The recent well-organised wave of street protests has involved parties from across the spectrum: from the radical leftist Occupy movement and the Spanish Outraged (Indignados) to the Patriotic Europeans Against the Islamization of the West (Patriotische Europäer gegen die Islamisierung des Abendlandes, Pegida) in Germany, especially in the city of Dresden. The latter movement combines mobilisation against ‘Islamisation’, a clear anti-elitist stance and scepticism regarding representative politics in general. In some instances, the street movements have led to the founding of a political party, most significantly in Spain with the Outraged movement. The leaders of the Spanish left-wing protest party Podemos (We can!) are individuals who had played a decisive role in the movement. In Germany, some leaders of the right-wing Alternative for Germany (Alternative für Deutschland, AfD) have declared their sympathy for the protesters on the street and stated that they share the same goals. This is not a new phenomenon: in the 1980s the alternative-left Green parties received support from various social movements. Due to their agenda-setting role, topics such as peace, ecology and feminism have entered the mainstream. Third, protest on the left is growing. This has been clearly demonstrated by Syriza, Podemos, the Five Star Movement (MoVimento Cinque Stelle, M5S) led by the Italian comedian Beppe Grillo, the (radical) socialist Left Parties in Germany (Die Linke) and France (Parti de Gauche), and the already forgotten project of the Pirate Parties in Sweden and Germany. Fourth, the phenomenon of anti-establishment parties has grown. This is especially the case in the long-standing democracies of Western Europe, following the examples in (post-)transition Central Eastern Europe. As the most recent elections in Central Eastern Europe have shown, and especially those in Poland, Slovakia and Estonia, there is still plenty of room for outsider parties. In this regard, it seems that the party systems in Central Eastern Europe are a trendsetter for the Western European ones and not vice versa. This article points out that the creation of anti-establishment parties is a real threat to conventional parties. Astonishingly, the research into the types of anti-establishment parties (which is still as basic as Schedler 1996) focuses more on the anti-systemic features of the extreme or radical right. However, European party politics has become highly dynamic, which means that its future has to be considered in a more general manner. Political parties need to transform their tools of organisation and participation in order to tackle declining memberships and to address the challenges of the digital age (Hartleb 2012). The rise of anti-establishment parties mirrors the changing European electorate, which is more volatile, more sceptical of the political elites and, in some respects, frustrated by ‘big politics’. The economic crisis has also accelerated the creation, growth and presence of anti-establishment parties in countries such as Italy, Spain and Greece. I will now analyse a typical anti-establishment party, its mobilisation strategies and its impact on the European political landscape. The UK Independence Party (UKIP) boasts all the features of an anti-establishment party. On its website the party describes itself as a ‘patriotic party that promotes independence: from the EU, and from government interference. . . . No to political correctness—it stifles free speech. . . . Only UKIP will return self-government to the British people’ (UKIP 2015). Unorthodox parties are often defined by what they are not—namely, orthodox or mainstream. A political party is classified as mainstream if its electoral appeal is based on a recognisable and moderate programmatic platform. Multicoloured outsiders from the left, right and no fixed ideological abode are attacking the mainstream centre–left and centre–right. They consider (mainstream) politics to be a redundant activity and argue that there is no distinction between the parties of the establishment. They use populist strategies to advocate the idea of the people against the politicians. Sometimes they use the logic that local politics is independent and not ideological. A good example of a party with this kind of electoral appeal is the Ordinary People and Independent Personalities (Obyčajní Ľudia a nezávislé osobnosti) in Slovakia, founded in 2011, which has entered the national parliament. Another approach is to ridicule politics, either with provocations—against conservatism and in favour of an unconventional, liberal lifestyle, as is the policy of the left-wing Palikot’s Movement (Ruch Palikota) in Poland—or with comedy—as is the aim of the left-wing M5S. There are often scandals in anti-establishment parties because of their lack of experience. After the media reveal the truth behind the scandal, the parties accuse them of lying and being disrespectful. This sometimes even results in strengthening the position of the outsider party. The Europe-wide success of new parties is, in many ways, astonishing considering their lack of resources, members and, to some extent, traditions. The latter factor has become less important because of anti-elitist tendencies in the media, the public’s attraction to new and unconventional parties, and the logic of the media systems themselves (e.g. the popularity of talk shows and short slogans, and the arrival of social media). Furthermore, these new parties sometimes have creative financing tools, or entrepreneurs as sponsors. The AfD is a good example of this: it has established an online gold shop where it sells gold (at a higher rate than the banks) to people looking ‘to buy gold products and simultaneously support the AfD’ (Dw.de 2014). The party argues on its website that ‘gold is fundamentally a product which is perceived by many citizens as a crisis-resistant and forward-thinking form of investment’ (AfD 2015). The party also advertises Deutschemark coins, symbolising its criticism of the euro (see AfD 2015). The income from the sales (a profit of around €2 million in 2014) seems to be in line with the rules of party funding, despite open criticism (AfD 2015). Thus, anti-establishment parties in general often take the structure of a commercial company based on a business interest. A major anti-elitist theme for these parties is Euroscepticism, which comes in many forms. It brings the parties together, for example the left-wing Syriza and the right-wing FN. The specific Greek and Spanish criticisms against austerity, the Troika and the dominant role of Germany are predominantly rooted in the rise of radical left-wing anti-establishment parties—but also in the rise of the right-wing extremist Golden Dawn (Chrysi Avgi) in Greece. It is obvious that differences exist in the wide spectrum of anti-establishment parties, such as the differences between the anti-neoliberal (anti-austerity) southern European protest parties and the anti-immigration parties in the north. In a broader context, their politics are based on fear, resentment and stereotypes of all forms of modernisation, globalisation and harmonisation. Anti-establishment parties focus on the ‘neoliberal’ enemy stereotype to support their arguments in favour of the fatherland and the economic, political and cultural protectionism of the ‘nation’. 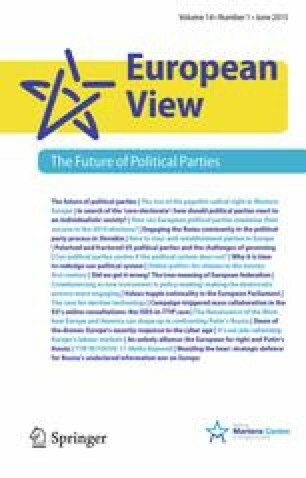 Citizens today express widespread scepticism about political parties as state institutions (with polemic use of the words ‘Partitocrazia’ or ‘Parteienstaat’), and the process of representative democracy based on political parties. Most citizens believe that parties do not care what they think, are not sufficiently responsive to public interests and cannot be trusted to represent them. From this position, it is only a small step to protest voting. This is the practice of voting for an anti-establishment party not because of the actual content of its electoral message but to ‘punish’ the conventional parties. This practice has been used as a general explanation from scholars for a variety of electoral outcomes in Western democracies. Certainly, anti-party sentiment increases voter volatility, and hence directly contributes to the weakening of partisan attachments. However, this seems to be too simple an argument to explain the repeated success of the new challengers. Citizens who are disenchanted with political parties have three basic options at election time: abstaining, voting for an anti-establishment party or voting for an established party (including switching from centre–left to centre–right). Anti-establishment parties profit from the assumption that the ideological and even pragmatic differences between the mainstream parties have diminished in many important policy areas such as the economy, the environment and the family, and also in European and foreign affairs. There is no single element in their electoral appeal and party structure that is shared by all anti-establishment parties. These parties mainly appeal to the losers of globalisation, but not only to them. People from the middle classes in wealthy countries such as Norway, Sweden, Denmark, Finland, Switzerland and Germany are also attracted to anti-establishment parties. These parties bring more conflict and polarisation to the political debate, for example in Italy or the Czech Republic, where the people have shown their disillusionment with the political elites, especially after the corruption scandals revealed in the media. Politicians accused of breaking the law do not enhance the reputation of the establishment. The public also expect higher moral standards from them, including in their private lives. Not surprisingly, the new challengers have had success in those democratic systems which are based on consensus, often with a traditional dominant two-party system. The anti-establishment parties have frequently achieved this success by breaking up the elite’s commitment to consensus and disrupting the classical method of reaching compromises in meetings, parliaments, summits and so on. As the polarisation between establishment parties decreases, the anti-establishment parties are able to gain more electoral support. Anti-establishment parties refer to a nostalgic past (especially in the fields of European integration, where they speak of a Europe of nation-states), to a new path for democracy that includes strong participatory or autocratic elements, or to a combination of both—as is the case with Beppe Grillo’s M5S and radical right-wing populist parties such as the FN and the FPÖ. Some anti-establishment parties aim to create a system that involves more direct voter participation, while others want a more autocratic hierarchy. Direct democracy often serves as a placebo and can combine both aims: it attacks the model of representative democracy by showing distrust of the parliamentary decision-making process and the rationality behind it. In this respect, the anti-establishment parties challenge the relevance of political institutions. Direct democracy can be decisively influenced by the popular mood, business interests or stereotypes of foreigners. the formulation of a clear message (ideologically or pragmatically driven). Modern politics in the framework of multi-level governance is often technocratically driven, as this is the administrative modus vivendi for problem-solving. The new anti-establishment parties have adapted this style by combining the claims of simplification and creating an ‘expertocracy’. Some of the decisive figures in anti-establishment parties use the label of ‘expert’ in order to demonstrate how they differ from ordinary politicians. The leaders of such parties sell their lack of experience in politics as an added value. For example, Bernd Lucke, the leader of the AfD, is a professor of economics who lacks any real charismatic ability. Although he is not an expert on currency issues, his reputation as an economist helped him considerably when it came to establishing the credibility of the party platform, which originally began with criticism of the euro and Germany’s role as the decisive loan provider and actor in Europe. Pablo Iglesias Turrión, the leader of Podemos, has recently been awarded an honorary professorship in political science. Furthermore, Syriza appointed Yanis Varoufakis, a popular professor and media professional, as the Greek finance minister and the face of crisis management. Varoufakis plays the showman card, portraying himself as living a trendy lifestyle through a combination of provocative statements, portrayals of his private life and constant interviews in the national and foreign media. These new entrants into the political arena in Greece and Spain are benefiting from the poor economic and social conditions in their countries, which are encouraging a disaffected electorate to search for electoral alternatives to the more established parties. ‘There is an alternative’—the basic mantra of anti-establishment competitors—refers to the established politicians, to the model of representative democracy, to the mainstream parties, to the media system, to the economic system, to the EU, to Westernisation and so on. The alternative option has been demonstrated in the close ties that some political parties have with President Putin’s autocratic Russia. Syriza, the Hungarian Jobbik, UKIP, the AfD and the FN have all built up privileged relationships with Putin in order to offer an alternative to the transatlantic ties in European politics. This relationship includes common conferences, financial support and friendly statements (Political Capital Institute 2014). On the other hand, Russia accuses European countries of having ‘Nazi’ parties in parliament (and this now extends to Estonia since the Conservative People’s Party of Estonia (Eesti Koservatiivne Rahvaerakond) entered parliament after the March 2015 elections). ‘The alternative’ is manifested in very short bullet-point programme statements. These often leave out important facts and details, and prefer to make generalisations (especially after cases of corruption among the elites) or to manipulate statistics. In the longer term, a pure anti-establishment party (if it is not also anti-system) needs to ensure that it is not transformed during the process of office-seeking. The new parties are organised in very different ways: there are virtual or blog parties, such as the M5S or the Pirate Party; couch parties (where the members of the party can virtually sit on one couch or on one seat), such as Geert Wilders’s Party for Freedom; parties with a strong hierarchy, such as the FN or the FPÖ; and those with a decentralised structure, such as Syriza. The parties also claim to have new modes of communication, being either highly personalised or responsive (e.g. via virtual participation). Anti-establishment parties stand apart from the mainstream parties. This separation is often visible in personal matters. Anti-establishment parties are weakened by their newly elected candidates’ lack of experience. These new anti-establishment parties have chosen their candidates in fast-moving procedures without having had the chance to get to know them over a longer period. Thus every anti-establishment party has to deal with crisis management, whether in the shorter or the longer term. Often the media investigates these parties’ internal structures, and their lack of professionalism is revealed through statements and interviews, or on social media. Sometimes the darker pasts of some of their activists are uncovered, especially concerning statements and comparisons made, the playing down of human rights or democratic freedoms, or the use of stereotypes when speaking about minorities or other nations. A recent example is that of the Dresden Pegida leader Sebastian Lutz Bachmann, who quickly resigned after his criminal past was revealed as a result of his public boasts. In Facebook posts he praised the Ku Klux Klan and denounced immigrants. The fast-growing character of anti-establishment projects also leads to internal rivalries about the course being taken, the issues covered and so on, as has been the case from the beginning for the AfD. Personal scandals cast doubt on the claim that the parties will clean up corrupted politics. The parties are not homogenous, but have an emotional internal life without discipline. Here are some examples. The Austrian Jörg Haider, the epitome of a right-wing populist leader, once left his own party, the FPÖ, and founded a new one (since his death in 2008, many scandals and a whole system of patronage and clientelism in Carinthia, where he governed for a long time, have been revealed). The French Marine Le Pen has just forced her father, the founder and long-time leader of the FN, to step down. And in Germany, Lucke is no longer supported by all members of the AfD since there is no agreement on how to deal with the radical wing of the party. However, due to the protest character of these parties, such scandals may not automatically endanger or damage the whole project. For example, both the FN and the FPÖ have shown in recent decades that such parties can even recover from splits (in both cases former party members formed new parties). However, others have disappeared from the political landscape, for example the Dutch Pim Fortuyn List (Lijst Pim Fortuyn, LPF), the Self-Defence of the Republic of Poland (Samoobrona Rzeczpospolitej Polskiej) and the German Schill Party (Schill-Partei) at the beginning of the twenty-first century, and today, most probably, the Pirate Parties. The unorthodox appeal of such parties brings some risks. Their leaders have two main options if they hope to escape a return to electoral marginality in subsequent elections. The first is to enter the realm of mainstream political competition by adopting a recognisable and moderate ideological platform. This would follow in the footsteps of the Green parties, which became part of the established system by removing fundamental positions from their platforms, both in terms of policies, such as peace, and in terms of democratic reforms, such as varying the numbers of members of parliament. The second alternative is to change the issues on which they base their discourse. This would follow the right-wing populist parties, which have shifted their platforms from neoliberalism to counter-globalisation and from anti-immigration to Euroscepticism and, perhaps, after the most recent terrorist attacks in Paris and Copenhagen in 2015, back again. The question thus arises of how the anti-establishment parties are changing politics. As argued above, they are not necessarily anti-systemic or anti-democratic. Certainly, they can influence policies in various ways: in recent years they have ensured a stricter approach to immigration issues and brought Euroscepticism into the mainstream. A good example of the latter is the British Conservative Party’s turn away from Europe due to the strength of UKIP. David Cameron has played the Eurosceptic card by questioning the UK’s membership of the EU and imposing stricter rules on immigrants who enter the country from outside of the EU. A more general effect that can be observed is that mainstream parties are trying to counter the anti-elitism with slogans such as ‘we are not ordinary politicians’. There have already been widespread attempts to include people from outside the political world—especially public figures, businessmen, and TV-show and sports stars—on party lists. The strength of anti-establishment parties could enforce the tendency to trivialise politics (in a ‘fast food’ format), for example by offering simple solutions to complex problems. National politicians are also using ‘Brussels’ as a scapegoat and accusing the institutions of being anonymous and bureaucratic. Anti-establishment parties can alter the coalitional dynamics within party systems—for example, by acting as exit options for grand coalitions or simply by forcing the other parties to form a coalition against them; since the rise of right-wing populism in the 1990s, Austrian party politics has offered a good example for both of these situations. As a result, anti-establishment parties may also become ordinary mainstream parties (as in the successful case of the Green parties). A more difficult and complex effect is the connection with voter turnout. The arrival of outsider parties may increase general anti-political or anti-mobilisation feeling among the public, as was the case in Austria after the FPÖ was first elected, or as is currently happening in Germany as a response to Pegida’s anti-Islamic street protests. It is possible to create a new wave of mobilisation by campaigning on new or long-neglected taboo topics and activating non-voters who are frustrated with politics. There are serious concerns about the combination of the new protest culture in the West and some intellectual aspirations, such as ideas for revolutions, especially in the framework of counter-globalisation movements (Hartleb 2011). The success of anti-establishment parties has disturbed the traditional system in which mainstream parties have been the front runners for forming governments, making policy and supporting the integration of society in politics. Anti-establishment parties often attack basic societal values such as respect, mutual understanding, compromise, solidarity and tolerance. They strengthen the stereotypes of ordinary political parties, elites, hierarchies and the principle of representation itself. The success of anti-establishment parties has little to do with the classical distinctions in politics of left versus right, libertarian (such as UKIP) versus authoritarian (such as the classical right-wing and national populist parties like the FPÖ or the FN), and democratic versus extremist. It has constructed its own dichotomy of the elites versus the people, creating a cleavage between the rulers and the ruled. Meanwhile, these parties are trying to mark themselves out as anti-establishment forces (with an open and artificial divide from the traditional hierarchical system). The call to ‘throw them all out’ has awakened general support from angered citizens. The success of these parties offers a (more) radical rejection of traditional party politics and represents a desire for change that comes from outside the system of modern, representative democracy. The public scepticism regarding political parties can be regarded as a general symptom of the public’s growing doubts about representative democracy and its need to search for other democratic forms. What, then, are the options? The increased use of referenda, citizen hearings and other forms of direct action would at least allow voters to partially bypass partisan politics. But as has been shown by the Swiss referendum on immigration, to give but one example, this method of direct democracy can increase resentment, especially against minorities and Muslims. On 9 February 2014, 50.3 % of Swiss voters (with a majority of 0.6 %) voted for the Citizens’ Initiative Against Mass Integration. Switzerland has the longest tradition of direct democracy on the national level in the world. The Conservative People’s Party of Estonia, which has just entered the national parliament after elections in March 2015, has unsurprisingly called for ‘direct democracy’ as a remedy: it is recommending the use of referenda in order to bypass or weaken parliamentary authority. Changes in policy administration are also likely to follow, as people demand a direct voice in politics because they do not trust the parties to act as their agents. All mainstream parties must advocate the legitimacy of the result in the political contest and push for a debate about old and new values in the changing European societies. Alternative für Deutschland. (2015). AfD ist Gold wert. www.afd-gold.de/. Accessed 14 March 2015. Dw.de. (2014). Cash for gold—German euroskeptics’ fundraising in question. 21 November. http://www.dw.de/cash-for-gold-german-euroskeptics-fundraising-in-question/a-18079642. Accessed 17 April 2015. Political Capital Institute. (2014). The Russian connection. The spread of pro-Russian policies on the European far right. Budapest. http://www.riskandforecast.com/useruploads/files/pc_flash_report_russian_connection.pdf. Accessed 4 March 2014. UKIP. (2015). Issues. What we stand for. www.ukip.org/issues. Accessed 17 March 2015.